Definitely not just any fundraiser. This is fundraising on a different level. You can’t even call it a fundraiser – it’s a gala! (My office mates and I had multiple discussions on the proper pronunciation of this word.) 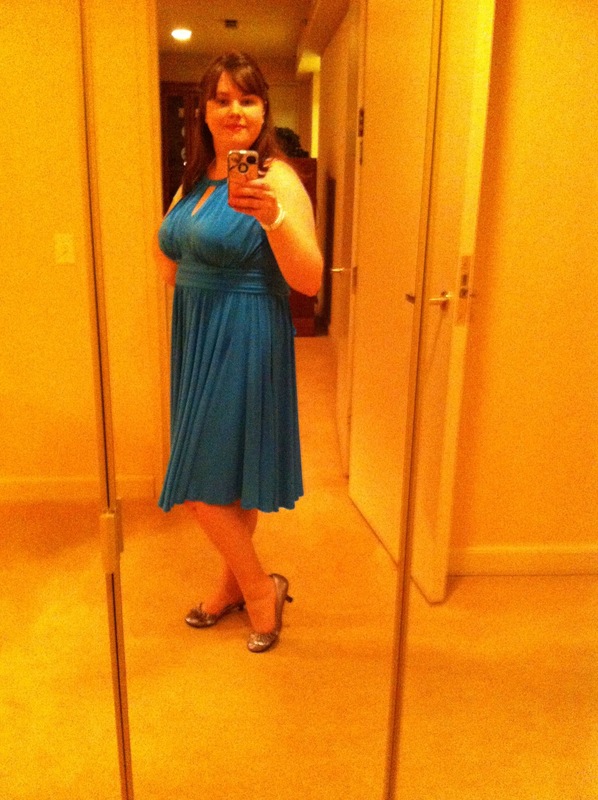 It’s gala season, and last weekend it was my company’s turn. I felt out of place, but luckily I didn’t notice because I was too busy working. Here’s how the evening went down (including a few pieces of photo evidence). 2 p.m. – Arrive at the theater and load up. I have a car so I have agreed to lug lots of office supplies and such to the event. This means I had to drive downtown (eek!) which could have been a little nerve-wracking. But since I had passengers in the car with me, I put on my brave face. 3:30 p.m. – Arrive at the swanky hotel. I park the car which means I get out of unloading responsibilities. Yay! Downside: I have to find parking. 3:50 p.m. – Labels. I get to label all of the paddles for the live auction. 200 guests are registered and each paddle needs a label on the front AND back. That’s 400 labels. This is very exciting work. 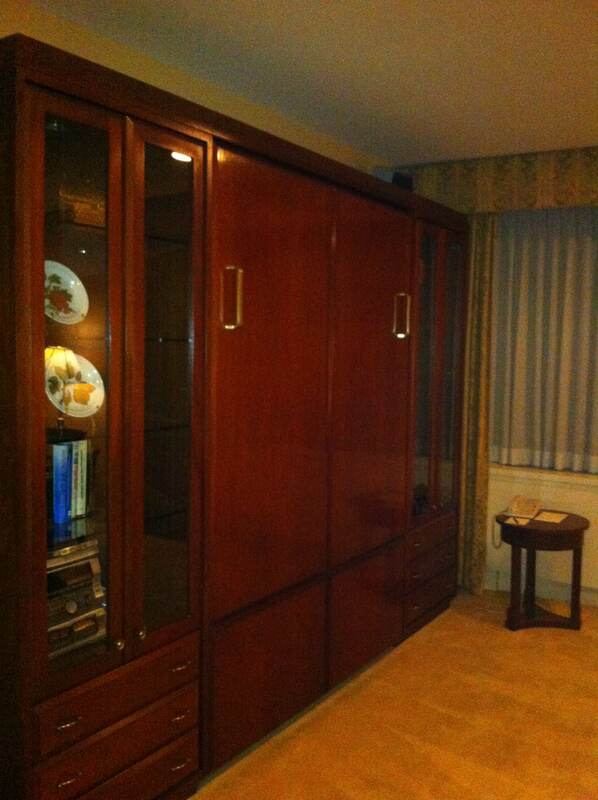 This is wear the Murphy bed is hiding. Sometimes, I clean up nice. 6:00 p.m. – Guests are arriving. My job is to stand by a bunch of files and pass them to those ‘checking in’ the guests when they call their name. (Heels might have been a bad idea.) It kind of reminded me of that party scene from The Devil Wears Prada when Anne Hathaway whispers the names of all the important people to Meryl Streep because she can’t be bothered to know everyone’s name. I felt lots of pride when I overheard the name of the person standing at the table and had the file ready before anyone asked for it! 7:15 p.m. – My dinner break. 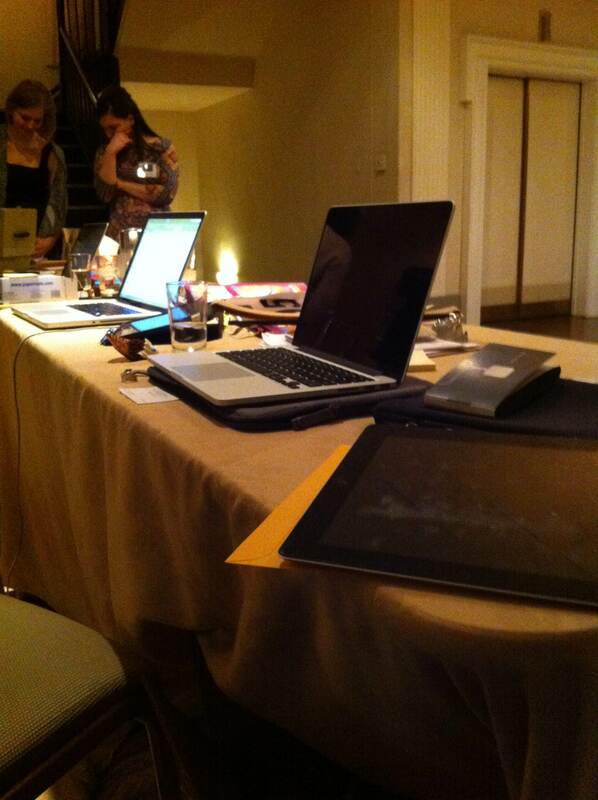 The hotel has provided a holding area for everyone working the event. I call this room ‘where the little people eat’. 7:45 p.m. – The silent auction closes while a member of the hotel staff wanders through the room with a tiny xylophone. This is how dinner is announced. I wish all major announcements in my life were announced with tiny percussion instruments. 8:15 p.m. – I read over the winners of the silent auction while a co-worker inputs the information into one of the most complicated spreadsheets ever. Excel does some amazing things! Meanwhile a live auction is going on in the ballroom after dinner. They are auctioning off an African safari tour and tickets to the American Music Awards. No biggie. 8:45 p.m. – Last chance for the guests to donate, and last chance for us to input all the information into our magical spreadsheet. The land of the magical spreadsheet, where I spent most of the evening. 9:00 p.m. – Guests begin to check out. We tally any wins from the silent or live auction, raffle tickets, and donations. I run people’s credit card for literally thousands of dollars. I act like I see these dollar amounts all the time when in reality most of the guests have spent 4 times my monthly paycheck in one evening. 9:30 – I’m still running credit cards for ridiculous amounts, but that’s ok because now I’m sitting down and I’ve changed into flats. The bad news is that my Spanx are starting to roll down my mid-section. Must all Spanx stay up only for the first three hours of the evening? Why? WHY?!? 10:30 p.m. – When will this night end? Luckily miniature cupcakes are being served. Someone brings me one. Since one will most definitely not be enough, I make a few more trips to the cupcake display. I eat at least 9 before the night is over. At this point, all shoes are off. I don’t have any pictures of the cupcakes. 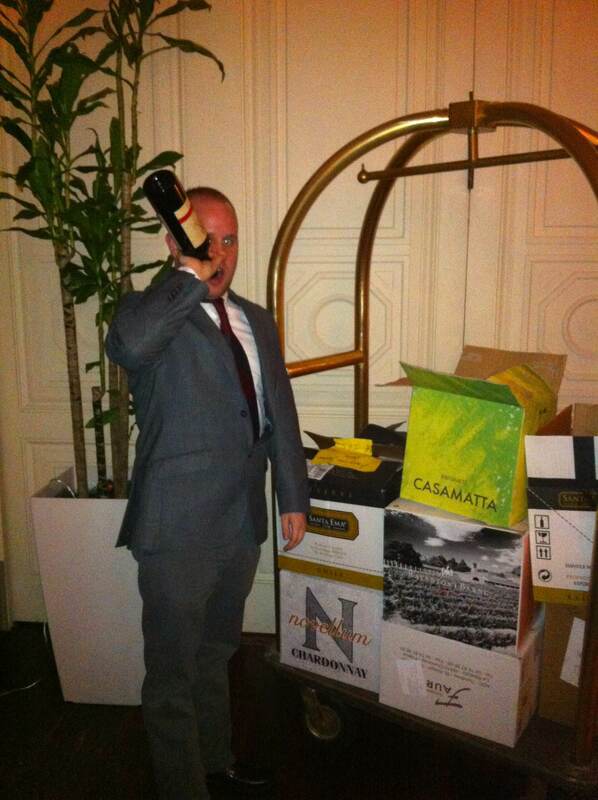 Instead, this is James babysitting a bunch of wine from the silent auction. 11:30 p.m. – Pack up the car and back to the theatre! 12:30 p.m. – Night over. I cannot fathom the amount of money that was raised in one evening. The theatre raised lots of money, and (bonus) it was pay day. Darn, if I had known I would have bid on the African safari. I’ll just buy the Lion King soundtrack and pay my bills – it’s practically the same. such fun to read! can’t decide what I liked best: the tiny percussion instruments, the spanx, or the tiny cupcakes. You are such a fun girl. You know I love The Lion King too! I forgot. I regret the lack of your education about the term Murphy bed.